Just 30,239 votes separate the Republican Scott and Democrat Nelson on Wednesday morning. Florida Sen. Bill Nelson, a Democrat, and Republican Gov. Rick Scott are within range of a recount in the Florida Senate race. Just 34,435 votes separated Gov. 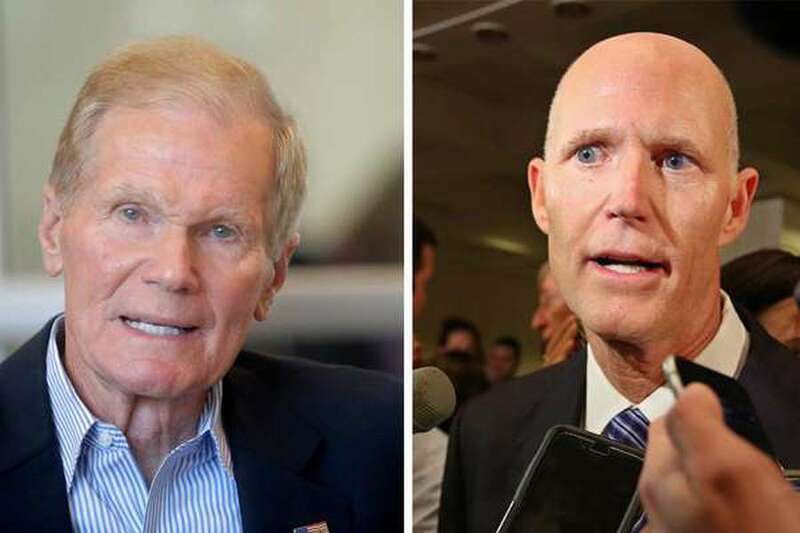 Scott and Democrat Sen. Bill Nelson on Wednesday morning, a difference of 0.42 percentage points. By early afternoon, the gap had narrowed again, to 30,239 as more ballots were counted. That's within the margin that could launch a recount. "We are proceeding to a recount," Nelson said in a brief statement, his first public remarks since results started coming in Tuesday. Scott campaign spokesman Chris Hartline said, "The race is over," but he acknowledged a recount will likely go forward based on the narrow margin between the candidates — unless Nelson declines to proceed. By law, a recount should be automatic. MORE: Here's what a recount would look like in Florida. If the two candidates are separated by one-half of a percentage point or less, state law allows for a machine recount of the results. Only Secretary of State Ken Detzner — an appointee of Scott — can call for a recount. If a machine recount ends with the two candidates separated by one-quarter of a percentage point or less, then a manual recount would take place. That's a time-consuming process of manually counting the ballots. If the results are that close, then every possible vote becomes more critical, including overseas and military ballots, provisional ballots and vote by mail ballots that have defects such as a missing or non-matching signature. Scott claimed victory just before midnight on Tuesday, taking the stage to chants of "Senator Scott" with nearly all precincts counted and a comfortable 60,000 vote lead. However, the Associated Press had not called the race as of Wednesday morning. Confusion at Nelson headquarters left reporters and a handful of straggling supporters believing the three-term Senator had conceded. Around 12:15, a campaign staffer briefly muted CNN and over a microphone told the crowd that, based on a number of media reports, the race had been called for Scott. "This is obviously not the result Senator Nelson's campaign has worked hard for," Pete Mitchell said in a posture of defeat. "The senator will be making a full statement tomorrow to thank all those who rallied for his cause." Bartenders had already packed up the Maker's Mark, and TV crews broke down their cameras. The already quiet room emptied quickly, with Nelson staff out of sight as news spread of Nelson's apparent fall. But after 1 a.m. Wednesday, the campaign put out a statement clarifying that Nelson was still waiting for all the ballots to be counted. The additional votes appear to have come from Broward County, where there were reports of difficulties sending in results. The Nelson campaign is preparing to have election observers in all 67 counties to oversee the recount process, it said Wednesday. He sent out a fundraising email Wednesday morning asking for donations to help pay for an "emergency response recount fund." Whatever the outcome, it's a fitting finish for a race that has been neck-and-neck since the first poll of 2018 dropped in early February. Nelson by one over Scott, it said. A statistical tie. In the nine months since, Nelson and Scott campaigned on health care and immigration, red tide and blue-green algae, Russian hacking and Puerto Rico recovery, Nelson's missed Senate votes and Scott's intertwined investments, a Navy hat and an empty suit, a Supreme Court pick's beach week and a private beach statute tweak. There was a debate. There was a hurricane. There was a debate over when to debate after the hurricane. Scott campaigned with President Donald Trump. Nelson campaigned with former President Barack Obama. Well over $100 million was spent, much of it on television ads. After all that, about half of one percent of 8.1 million votes separated these two. Times/Herald Tallahassee Bureau Staff Writer Steve Bousquet and Claire McNeill contributed to this report.